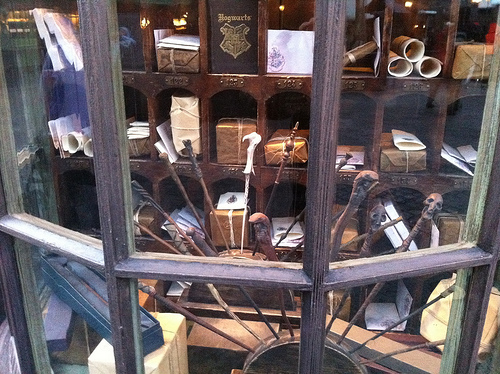 Ollivander’s Wand Shop is a definite must see when you visit Wizarding World of Harry Potter. Remember the scene from Harry Potter and the Sorcerer’s Stone when Harry goes to Ollivanders to get his first wand? If you are the ‘chosen one’ at Ollivander’s you can have a very similar experience to Harry himself and find out which wand is your perfect match. Harry Potter fans will of course realize that in the books Ollivander’s is located in Diagon Alley not Hogsmead as it is here. But the Ollivander’s in Wizarding World is a branch of the famous store which of course explains the different location. It is safe to watch this video which was made before the opening of Wizarding World as it just gives an overview of what is inside, rather than giving away rather than the specifics. The first thing to realize is that isn’t the shop that the line is for. This is the Ollivander’s experience. I have heard many people in the line or looking at the line who are confused as to what Ollivander’s actually is. People tend to ask do you really have to stand in that line to buy a wand? No. As you would expect there are a number of locations where you can buy a wand in Wizarding World and Islands of Adventure. The shop at the back of the Ollivander’s attraction, an outside stall just near the entrance to The Flight of the Hippogriff and the large store near the Point of Entry in Islands of Adventure. When you finally reach the end of the line (yes it can be a long wait) you will be welcomed into a small room which looks remarkably like the one in the Harry Potter movie. Not many guests are admitted at one time and this is why the line can get so long. How do you avoid time standing in line? The advice is the same as for all of the Wizarding World attractions – arrive early or stay late. The attraction only admits around 25 guests at a time and lasts around 5 minutes. So you can see why the line quickly builds up as it really can’t process that many people in an hour. Once inside your eyes are drawn upwards to look at all of the amazing detail on the shelves in the room. The room is about 30 feet tall and has, as you would expect, a huge amount of detail. You feel as though you have truly entered a movie set. Then you will notice Ollivander, usually standing on the stair case or behind his counter. 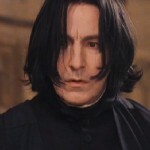 He is looking around the room for a guest who will be the one who has the chance to be chosen by a wand. Usually a child is chosen, although I have seen some 20 somethings chosen. Occasionally 2 guests are chosen (this has happened to my 5 and 9 year old). How do you increase your chances of being the ‘chosen one’ for Ollivanders Wand Shop? Wearing some kind of Harry Potter merchandise definitely seems to increase your chances. A scarf or a robe tends to be a good choice. This is an experience which can really make your young Harry Potter fan’s vacation so if you can increase your chances of being chosen they will probably be ever thankful for it! Once someone is chosen Ollivander explains that of course the wand chooses the wizard and will select a wand for them and ask if they will try a test spell with it. There are a number of different effects that can happen including a flower wilting, the wand boxes falling and sounds of thunder heard. Then Ollivander will start ask the recipient when there birthday is. There are 13 possible choices of wand and the choice is based upon the Celtic calendar. When finally the correct wand is chosen then an effect which is reminiscent of the movie will be recreated. Of course the person chosen is invited to purchase the wand but there is no obligation to do so. It is pretty tempting though – you tend to get caught up in the magic of it all! All the guests will then exit the experience and go into the wand store where there are many different types of wand for sale. The 13 wands which are used in the attraction are exclusive to Wizarding World, but the others are also available online as part of the Noble Collection. the exclusive ones are all named after a certain type of wood such as holly, vine and rowan. Each has unique magical properties of course. There are also numerous character wands available. The display shelves are piled high up to the celling and an example of each wand is displayed. Each individual wand is priced at $29.95 plus tax and is stored in an attractive case. The shop is small and tends to get extremely crowded. But the crowds do tend to come in waves and then clear out pretty quickly. The attraction empties out into the shop so of course 25 people arrive in a very small space all at once. Many of those clear out within minutes so if you just wait for a short while it is easier to browse before the next batch of guests exit the Ollivander’s attraction. Ollivander’s Wand Shop really is something that you must experience if you have children with you. Ask the wizard on the door of the wand shop as to what the estimated wait time is to see if you are willing to stand in line for that length of time.